FSC is undermining its own legitimacy and (more importantly) struggles in the South against monoculture tree plantations. The record is not good. By Chris Lang. Published in WRM Bulletin 134, September 2008. Asia Pulp and Paper is probably the most controversial paper company in the world. It has destroyed vast areas of forest in Sumatra and replaced hundreds of thousands of hectares with monoculture plantations. In December 2007, the Forest Stewardship Council announced its “dissociation” from APP after the company starting using the FSC logo. FSC issued a statement saying that it has “a duty to protect the good will and integrity associated with its name and logo for consumers and for our trusted partners and members.” At last, it appeared, FSC had noticed it is greenwashing environmentally and socially destructive companies. Unfortunately, the dissociation from APP remains a one-off. FSC’s goal is “to promote environmentally responsible, socially beneficial and economically viable management of the world’s forests.” FSC should not certify industrial tree plantations, for the simple reason that they are not forests. FSC should no more certify plantations that it should certify fields of lettuce. Industrial tree plantations are neither environmentally responsible nor socially beneficial. They are often only economically viable as a result of generous government subsidies. Veracel is perhaps the most egregious example of the many companies that should never have been certified by FSC. Since the company established its monoculture eucalyptus plantations in the south of Bahia state in Brazil, rivers, streams and springs have dried up. As the company’s plantations have expanded the area of land planted to food crops has decreased. Rural people have lost work and moved to cities, many living in overcrowded and dangerous favelas. In July 2008, The Brazilian Federal court fined Veracel for clearing Atlantic rainforest. The court ordered Veracel to replace its eucalyptus plantations with native trees. Veracel’s certificate remains in place. Last year, armed guards employed by another FSC-certified plantation company, Vallourec & Mannesmann (V&M), shot and killed Antonio Joaquim dos Santos in front of his 16 year-old daughter. He was collecting firewood. A year before the shooting, local people submitted a complaint, pointing out that the replacement of the native savanna (cerrado) with V&M’s monocultures has left the community without access to firewood and fruits. V&M’s response was to increase the pressure on the community. A few weeks after the murder of Antonio Joaquim dos Santos, V&M announced its “voluntary decision to leave FSC”. In Uruguay, WRM has documented the near-slave labour conditions in FSC-certified plantations. FYMNSA, one of the FSC-certified companies, “was violating labour rights”, said Jose Bautista, the head of a local workers union. “It should ever have been certified,” he added. Eufores, another FSC-certified company, was recently caught clearing 80 hectares of strictly protected forest in Uruguay. The company is a subsidiary of the Spanish company ENCE. In June 2008, another ENCE subsidiary, NORFOR, saw its FSC certificate withdrawn in Spain. Among the problems that NGOs pointed out were indiscriminate use of herbicides, damage to the soil, increase in erosion, clearcuts of more than 20 hectares and the use of exotic species. In Ireland, Coillte has about 450,000 hectares of pesticide-laden monoculture plantations. After a 2007 audit, the body which checks that FSC standards are upheld, Accreditation Services International (ASI), found that “non-compliance with relevant FSC Criterion is likely to be ongoing for a few years”. Nevertheless, Coillte remains FSC-certified. FSC is well aware of the problems with the certification of plantations. It has been working on a “Plantations Review” since the 2002 FSC General Assembly. At the time, FSC had certified 3.3 million hectares of plantations. The figure is now 8.6 million hectares. The plantations review has made no difference whatsoever to the way FSC certificates are issued. In fact, FSC actively promotes industrial tree plantations, by aiming to increase sales of FSC-labelled paper. FSC’s “Global Paper Forum” brings several hundred industry representatives together to find “Market opportunities for FSC-labelled paper”. This year’s Forum was sponsored by Mondi and Suzano among others. FSC’s General Assembly, which will take place in South Africa in November, is sponsored by Mondi, Tembec and Sveaskog. FSC urgently needs to distance itself from the industry it is certifying. Instead it is getting closer. As it does so, the FSC logo becomes little more than corporate greenwash. See APP-Watch for regularly updated information about APP’s record. Yumiko Uryu et al (2008) Deforestation, Forest Degradation, Biodiversity Loss and CO2 Emmissions in Riau, Sumatra, Indonesia“, WWF Indonesia Technical Report. “Without Remedy: Human Rights Abuse and Indonesia’s Pulp and Paper Industry”, Human Rights Watch, Vol. 15, No. 1 (C), January 2003. 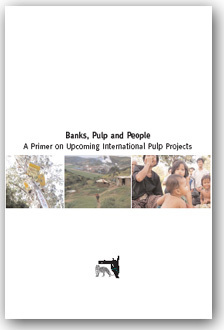 Ed Matthew and Jan Willem van Gelder (2001) “Paper Tiger, Hidden Dragons: The responsibility of international financial institutions for Indonesian forest destruction, social conflict and the financial crisis of Asia Pulp & Paper”, Friends of the Earth. FSC’s announcement of its dissociation from APP is available here. FSC produced a draft “Policy for the Association with FSC”, which it circulated to members in October 2007. Since then, the draft Policy seems to have disappeared without trace (I couldn’t find any reference to it on FSC’s website). From the Introduction to “FSC Principles and Criteria for Forest Stewardship“, FSC-STD-01-001 (version 4-0) EN, FSC International Center, Bonn, Germany, page 3. 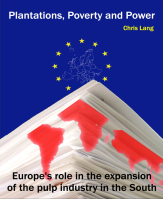 Chris Lang (2006) “Veracel pulp mill, Brazil: The impact of industrial tree plantations on land rights and livelihoods“, in “The European Investment Bank in the South. In whose interest?” CRBM, CEE Bankwatch Network, Friends of the Earth International and WEED, February 2006. 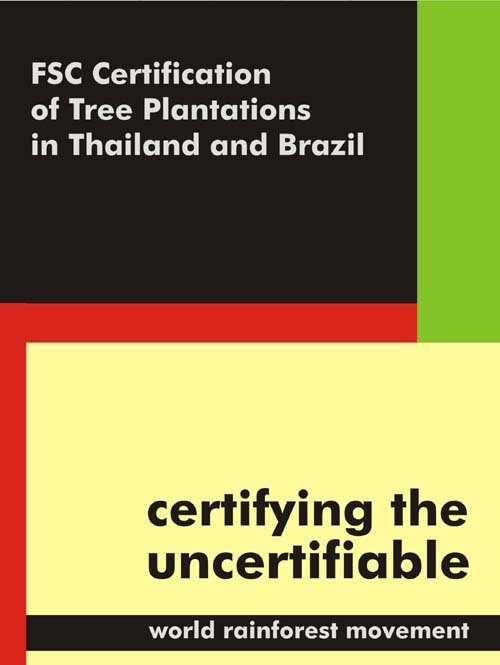 “FSC Certification of Veracel: A turning point or business as usual?“, “Brazil: The impossible certification of Veracel“, and “The reasons why Veracel cannot be certified, seen from the standpoint of society“, WRM Bulletin 121, August 2007. Ivonete Gonçalves (2007) “Brazil: Response to Veracel’s attempt to obtain the FSC label for its plantations“, WRM Bulletin 119, June 2007. “Brazil: Veracel’s deceitful practices“, WRM Bulletin 115, February 2006. Winnie Overbeek (2008) “Brazil: Historic federal court decision sentences Veracel Celulose (Stora Enso-Aracruz) for environmental violations“, WRM Bulletin 132, July 2008. “Controversy deepens over Veracel certification“, FSC-Watch, 26 August 2008. “Brazil: An overview of monoculture eucalyptus plantations“, WRM Bulletin 116, March 2007. “Peasant murdered by employees of FSC certified plantation company, Brazil“, FSC-Watch, 1 March 2007. Heidi Bachram (2006) “Carbon credits and the green desert“, Red Pepper, September 2006. “Brazil: V&M withdraws from FSC“, FSC-Watch, 22 March 2007. 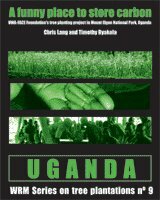 “Uruguay: Semi-slave work in plantation forestry“, WRM Bulletin 74, September 2003. See also “Uruguay: Labour conditions in two FSC certified tree nurseries“, WRM Bulletin 123, October 2007. “Certified plantations in Uruguay: Can the FSC really guarantee peace of mind to consumers?“, WRM Bulletin 108, July 2006. “ENCE loses one certificate in Spain. Soon to lose another in Uruguay?“, FSC-Watch, 22 August 2008. “Another NGO quits FSC in protest against NORFOR plantations“, FSC-Watch, 29 May 2008. John Vidal and David Adam (2008) “Timber hitch“, Eco-soundings, The Guardian, 30 April 2008. “How Accreditation Services International (FSC-ASI) allows certifiers to break FSC’s rules and issue certificates to non-compliant companies“, FSC-Watch, 16 March 2008. 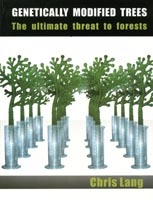 Philip Owen (2008) “FSC Plantations Certification – Many Wrongs make a Right?“, Geasphere, July 2008. Chris Lang (2006) “FSC Plantations Review: Raising the bar or lowering standards?“, WRM Bulletin 108, July 2006. 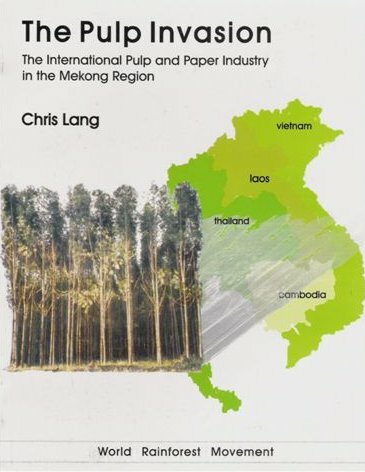 Chris Lang (2004) “Plantations are not forests – even when they are certified by the Forest Stewardship Council“, Watershed, Vol. 9 No. 3, March – June 2004. “Global FSC certificates: type and distribution“, FSC, 17 April 2008, page 7. “Writing the future“, 4th FSC Global Paper Forum, 09 – 10 June 2008 in Duesseldorf, Germany. “FSC GA 2008: Visit the iSimangaliso Wetland Park and SiyaQhubeka Forests“, FSC, 12 September 2008. This article left me a little confused. So if plantations are deemed not fit for certification, then what is the other alternative? And please don’t say recycled papers because I’ve learnt that fibres can only be recycled a limited amount of time before it gets to short and can no longer be used. Hi Lila, Thanks for your comment. There are several alternatives to the expansion of large scale industrial tree plantations. One of these is to use recycled paper. We also need to reduce demand for paper – this would mean that we don’t need to keep expanding the area of industrial tree plantations. The paper industry, of course, wants to keep expanding. The point of the article is to illustrate how FSC is helping to support the paper industry, rather than helping to support local struggles against industrial tree plantations.